Box Dimensions (LxWxH) 10.65 x 2.75 x 0.5"
126 Film Carrier is rated 4.6 out of 5 by 11. Rated 5 out of 5 by Andy from I would recommend this product to anyone. Having read online, whilst searching for a 126 film carrier, that this product was suitable for a VEHO film scanner, I thought I would give it a try. Even though the only place that I could find such an item was the USA and I am based in UK, I risked the item not fitting. However I thought that for this price I can't go wrong. It only took two days for this item to arrive and the postage was very cheap. I immediately tried it out on my VEHO scanner and it works admirably, holding the negatives securely. The only problem that I have now is to find some software that scans the 126 negs in 126 format not 35mm. Rated 5 out of 5 by JimmyMac from Works With Other Scanners Ji! 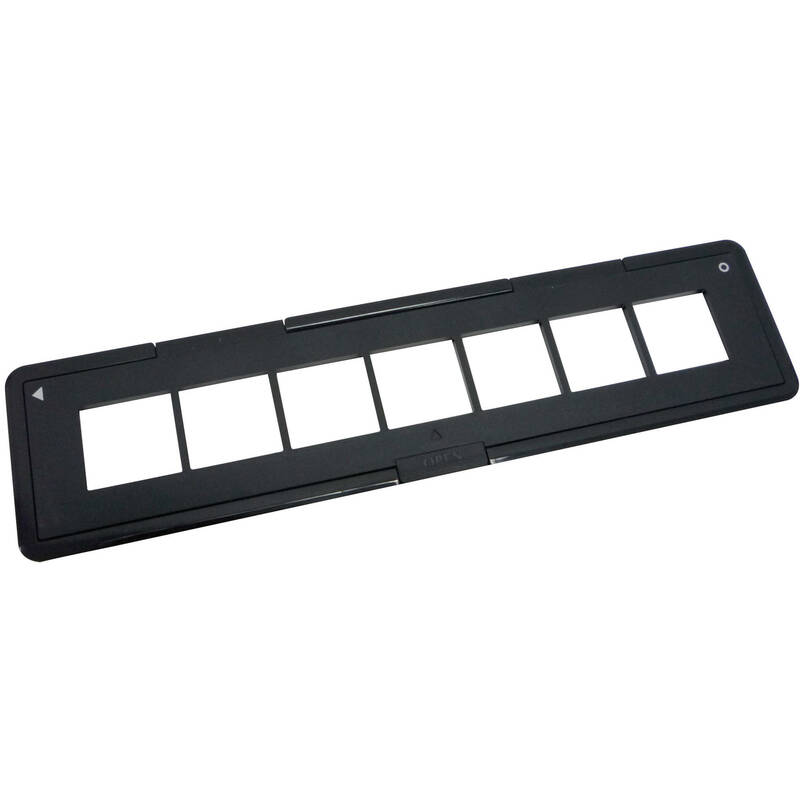 This film holder will fit other scanners besides the Pana-Vue brand.? I tried it in the latest Wolverine 22mp scanner and it fit OK with only a slight catch at the mid point of the holder.? This means it will fit the? popular JUMBL 22mp and probably several other brands of China made scanners that have those multi-purpose film holders that work poorly.? Note: because all these scanners are sized for 24mm high "35mm" images the scanner will not capture 1mm at the top and bottom of each 126 image. Rated 4 out of 5 by scanner from well built film holder I bought this because my scanner does not have a film carrier for 126 instamatic film and it's film carriers are similar in size. I believe I can mod this to fit my scanner but it will take some pretty extensive modifications. This carrier is far superior to the ones that come with my scanner because it uses imbedded magnets to keep the hold on the film firm and the thickness of the frame is better. The pana-vue scanners are not very good but the carriers for the film are. Rated 5 out of 5 by Photodude1 from Great Item! Took a chance purchasing this item since I didn't own that particular scanner. This item was fantasitc. It was constructed better than the original carrier that came with my scanner. It has metal clasps so you don't have to twist and unsnap the original carrier. It worked perfectly scanning in the 126 film. It actually worked in my scanner! Great product... It made my wife happy so what more could you want? Rated 5 out of 5 by Genmum from Better Quality than the Stock item. I recently purchased a Veho VFS-002m Slide & Negative Scanner that came with stock 35mm negative & 110 negative film carrier trays. I was also needing the 126 Film carrier for my 126 negatives. The Pana-Vue 126 Film tray works fantastic with my Veho and this tray is better quality than the stock items that came with the Veho. Rated 5 out of 5 by Frank from Great Design, Good Price This negative carrier is intelligently designed for ease of use and the handling of film strips. The hinged design is very convenient, and the magnetic closures are a stroke of genius. Rated 4 out of 5 by Ed from Well made It works with my Canon 9000F. Just made a cardboard insert to hold it straight. Would this tray work with the Brookstone I Convert negative and slide scanner? Unfortunately, this carrier would not be compatible with the Brookstone iConvert Scanner. Can this be used with the CanonScan 9000F? We are unable to test this and unfortunately have not used such a combination before. However, since the 126 film size is not available from Canon in the first place, we feel this film carrier probably will work acceptably. Can I use this with an Epson v800 scanner? Need to scan a bunch of Kodak Instamatic photos and the Epson 35mm carrier cuts off the top of the photos. I don't need auto-frame finding -- just need to be able to capture the image. We haven't tried this product yet -- going to be a winter project. Can the 126 Film Carrier by Pana-Vue be used with the Epson Perfection V500 photo scanner? What width is the actual carrier?